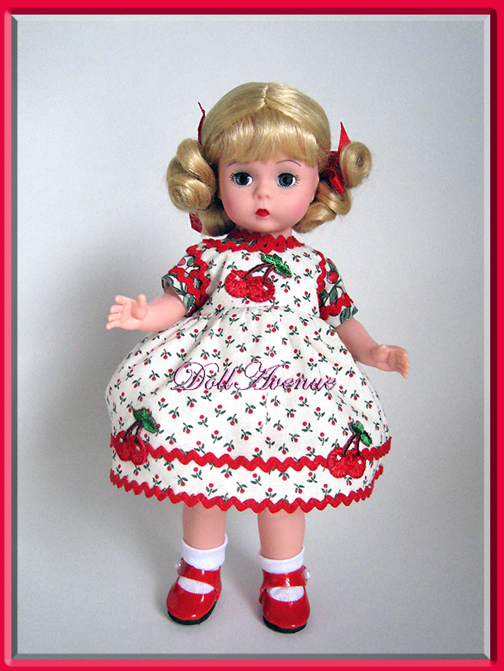 This is a darling 8" doll made by Madame Alexander we call "Wild Cherries." What a cutie Wendy is with her blonde curly ponytails tied with red ribbons and rosy cheeks. Wendy's Cherries outfit consists of a white cotton cherry print jumper dress trimmed in rick rack with a cute, contrasting print one-piece romper underneath. Embroidered cherry appliques decorate the front of the dress. Wendy wears white socks and red patent Mary Jane shoes with a pearl button. This darling Doll Avenue custom doll will arrive in excellent condition as she has never been displayed.